Oh Marlowe, we just love him! His type is super balanced and he produces such nice offspring! He is very short, wide, and smooth to the table. He has a beautiful head and very nice thick/open ears and a lovely crown. And look at that BONE…his bone is definitely his best trait and his front limbs are super short and stumpy. He has shown well for us and is one of our main herd bucks. He is definitely a favorite and has a forever home with us. 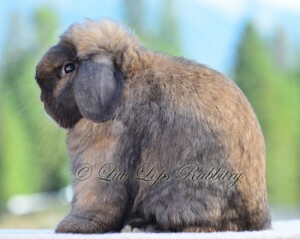 A Luv Lops’ Jewel son! Carriers REW.